The abstracts for the 2017 ASCO annual meeting, to be in held June 2nd to June 6th in Chicago, were released late yesterday. Among the 84 myeloma and/or amyloid or plasma cell disorders abstracts, there are 10 oral presentations. There are no blockbuster myeloma presentations this year. Most abstracts deal with results with novel combination therapies incorporating, for example, daratumumab (and other anti-CD38 antibodies), checkpoint inhibitors, venetoclax, pomalidomide, and carfilzomib. The results of the EMN02/HO95 (Hovon) trial for transplant-eligible patients evaluating the role of minimal residual disease (MRD) testing (Abstract #8011) will be presented. The denosumab and Zometa randomized trial dataset presentation will again illustrate the lesser renal toxicities with denosumab (Abstract #8005). An important analysis evaluates cardiovascular toxicities with carfilzomib (Abstract #8018). An interesting study finds that patients with an elevated BMI who have SMM are more likely to progress—important because of potential weight-loss intervention (Abstract #8032). Several studies look at costs. Overall, there are quite a few interesting observations here which are helpful in defining and refining novel agent treatment strategies moving forward. From May 4th through May 6th, the International Myeloma Foundation (IMF) made its presence known around the globe. Reflecting on the many activities the IMF was involved with, I realize how lucky we are and how critical it is to be part of so many wonderful and important collaborations. It is all well and good to have brilliant ideas alone in the research lab. But only by linking arms with like-minded people—scientists, patients, caregivers, and advocates—will we truly move forward to find the pathway to a cure. On April 15, 2017, Emma Morano passed away peacefully in Verbania, Italy at the age of 117 years, 137 days, and 16 hours! She was the oldest person in the world, according to her obituary. What explains her longevity? She lived very quietly in a church-owned apartment near beautiful Lake Maggiore. Was the lake's mild climate a factor, or perhaps the three raw eggs she ate every day for nearly a century? As always with long life, the role of diet emerges. Was it the three eggs each day or the lack of processed foods and sodas, or any number of other possible factors? How to live a long, healthy life has become an obsession in modern times as it seems we become less and less healthy. Two newly published studies that received funding from the IMF Black Swan Research Initiative® show how myeloma might be diagnosed and monitored in the future, and, perhaps, the genetic factors that might cause the disease. 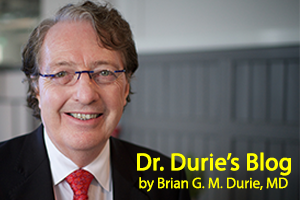 In his blog this week, IMF Chairman Dr. Brian Durie translates the studies’ implications and offers important caveats for patients to keep in mind. The Tsimane tribe lives in the Amazon lowlands of Bolivia. For some reason, according to a new study published in The Lancet, they do not get heart disease! The study, notes the New York Times, paired anthropologists with cardiologists to investigate.